Joshua Fields Millburn is a bestselling author, writing instructor, and international speaker. 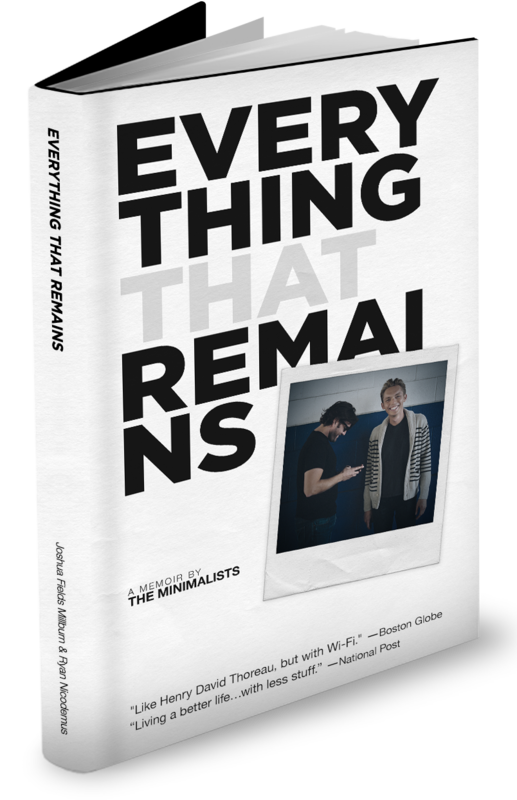 Best known as one half of The Minimalists, he is the author of four books, including a critically acclaimed memoir, Everything That Remains. He has been featured in Time, New York Times, Wall Street Journal, USA Today, Forbes, Boston Globe, San Francisco Chronicle, Chicago Tribune, Seattle Times, Toronto Star, Globe & Mail, Vancouver Sun, Village Voice, LA Weekly, and many other outlets. Born in Dayton, Ohio, in 1981, he currently lives in Los Angeles, California. Read more about Joshua Fields Millburn here. Blindsided by the loss of his mother and his marriage in the same month, JFM started questioning every aspect of the life he had built for himself. Then, he accidentally discovered a lifestyle known as minimalism…and everything started to change. consumption and the broken American Dream, he jettisoned most of his material possessions, paid off loads of crippling debt, and walked away from his six-figure career. So, when everything was gone, what was left? Not a how-to book but a why-to book, Everything That Remains is the touching story of what happened when one young man decided to let go of everything and begin living more deliberately (“Like Thoreau, but with Wi-Fi” —Boston Globe). Heartrending, uplifting, and deeply personal, this engrossing memoir is peppered with insightful (and often hilarious) interruptions by Ryan Nicodemus, Millburn’s best friend of 20 years.